All my life I've heard about Mountain View, Arkansas and finally about 20 years ago I had the opportunity to visit. It was everything I'd ever hoped it would be. Mountain View is a remote Ozarks town of about 3,000 people. The setting is beautiful and the town has all the comforts and conveniences anyone could need. But what's really special is the music. Mountain View promotes their music as "folk" music. It is a variety of folk and bluegrass as well as country music. You'll hear it picked on the square every night during good weather. 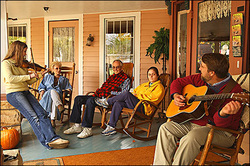 Mountain View is also home to the Ozark Folk Center state park which features real mountain and folk music. Every time I leave Mountain View I want to take a little bit home with me. Thankfully technology has allowed us to share Mountain View music with anyone on the internet. If you love Mountain View, we hope you'll like "mymountainviewmusic.com" and tell your friends about it. Everyone you hear on here has ties to Mountain View, Arkansas...and some of them are probably there right now picking on the square, the Jimmy Driftwood Barn, the Ozark Folk Center, or some other Mountain View venue.